Not sure if you heard, but George Clooney got married this weekend. 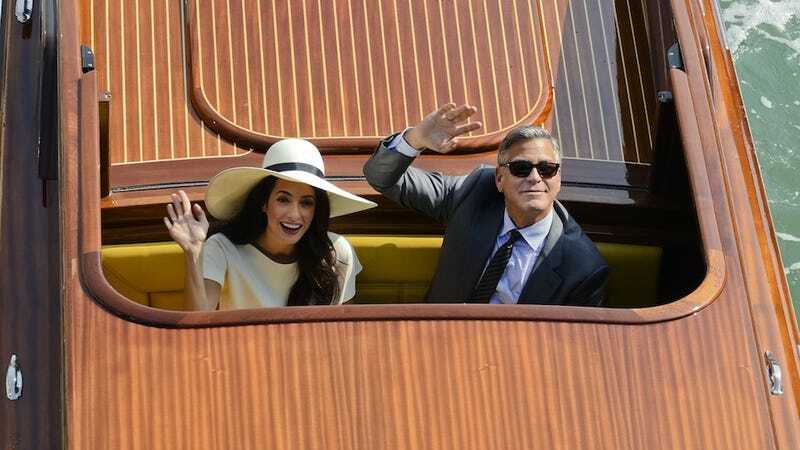 Here are some photos of the actor and his stunning powerhouse wife, Amal Alamuddin, leaving Venice's city hall. To what extent do you suppose the venue selection was influenced by that one waterborne fight scene in the 1989 classic Indiana Jones and the Last Crusade? No wedding photos yet (rumor has it that that the couple turned down an offer from Vogue, but WWD says People got the exclusive rights), but photogs snapped some shots of the couple leaving their civil ceremony earlier today. Name of the boat's a little on-the-nose. Must be George's doing.